What led up to this historic vote at the convention? 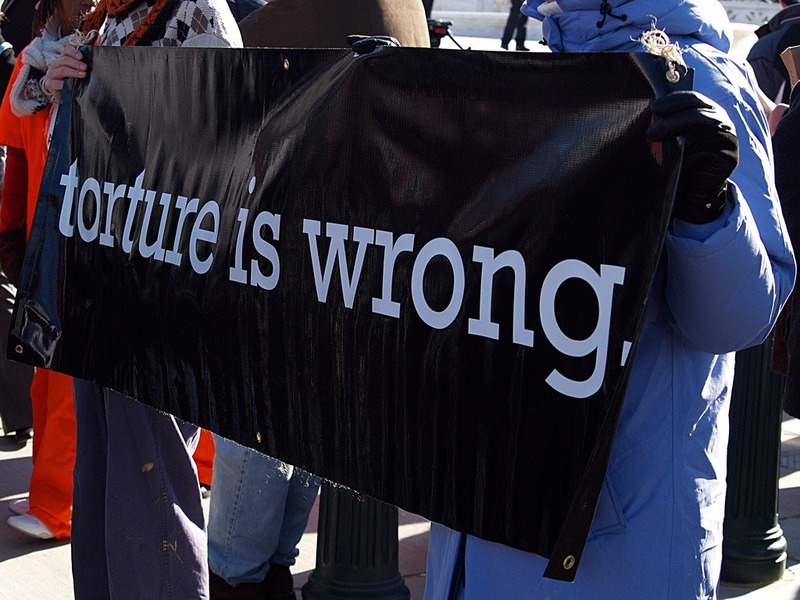 The vote resulted after many months of national media coverage, including near weekly coverage by the New York Times, and member advocacy demanding that the APA take a stand against psychologists’ involvement in interrogation and torture by the US government. The independent investigation was commissioned by the APA, only after enough pressure was created through a series of events and member advocacy efforts, which began in the fall of 2014, with the publication of Pay Any Price: Greed, Power and Endless War3, a book by New York Times reporter James Risen, which first disclosed the role of members of the APA Board in the Bush administration’s torture program. Immediately after the book was published, the APA responded with a public denial of their role and issued press releases asserting that Risen made “absurd and inaccurate accusations” and demanded that he rethink his notions about the APA4. During April 2015, Risen published a groundbreaking story in the New York Times that confirmed that the APA Board secretly collaborated on the torture programs5. It was based on recently disclosed documents, emails, and a report written by a group of psychologists who had been advocating against psychologists’ role in torture and interrogations since 2006 through an advocacy group called the Coalition for an Ethical Psychology. Again, the APA Board publically denied involvement through press releases. According to interviews with APA members, they increasingly demanded the board and the council of representatives change these controversial policies. Whenever members raised these concerns to the board and demanded changes to the ethics policy, they were treated dismissively and their complaints were ignored, rationalized away, or mocked. Those who spoke out were publically criticized by the APA Board. Why did these inexcusable acts of collusion and disregard for ethics and human rights happen within a prominent national association with over 122,000 members? Was it just because a few powerful individual “bad apples” in the leadership of the APA Board and staff were willing to disregard agreed-upon governance process and use any means necessary to support the Bush administration’s torture policies? Or was it something about the APA’s governance system that enabled a board culture of secrecy, collusion, and deceit to grow and fester in the back rooms of an association that purports to “advance the creation, communication and application of psychological knowledge to benefit society and improve people’s lives”? Similarly to many traditional boards, the APA Board is structured as an insular body of twelve people who, according to the APA bylaws, provide “general supervision of the affairs of the Association, supervises the chief staff officer, and serve as the administrative agent of the Council.” Although the council is comprised of 162 representatives, this body functions with limited authority, according to interviewed members, while the board and its officers essentially hold the primary power in the organization with little accountability. According to APA members and the APA bylaws, there are no stated policies or practices—in the bylaws or in practice—for the board to communicate, obtain feedback, or actively engage the council or their membership in any of the board discussions or decisions. Their tightly controlled and heavily secretive governance structure, one can argue, enabled and provided the foundation for the ongoing collusion and countless incidents of deceitful, manipulative, and unscrupulous board behavior. Interestingly, the APA bylaws also allowed for the board to declare an “emergency” and convene a decision-making board meeting without consulting the council. The board clearly exploited this rule to decide APA policy regarding torture and interrogation, apparently in secret to avoid any consultation or engagement with the council or the general APA membership. Member organizing and advocacy, resignations, and calls for board action, along with frequent press coverage, resulted in the passage of the eventual resolution to end psychologists’ complicity in government interrogations and torture programs. Through constant pressure, the members demanded that this resolution be brought up for a vote and for the APA to reconsider their governance. We have now witnessed several significant examples in the nonprofit sector, as reported by NPQ (e.g., Sweet Briar College, Susan G. Komen), demonstrating the imperative for increased constituent and stakeholder engagement in governance. The APA scandal provides additional evidence that boards need to open their traditional boundaries, becoming more transparent and accountable in their actions and communications. More importantly, they need to actively engage their constituents and key stakeholders in institutionalized, shared governance decision-making. The APA scandal, and the way this board was enabled to go rogue, should serve as a wakeup call to the nonprofit sector to reconsider their governance models. The governance status quo may once again allow a small cadre of zealots to misdirect organizations to further their private and secret agendas at the expense of their stakeholders. Our constituents deserve better. APA Council of Representatives Resolution 23-B Banning Psychologist Participation in National Security Interrogations, passed August 7, 2015. James Risen, “Psychologists Approve Ban on Role in National Security Interrogations,” The New York Times, Aug. 6, 2005. James Risen, Pay Any Price: Greed, Power, and Endless War. Boston: Houghton Mifflin Harcourt, Boston, 2014. “APA’s Response to Risen Book and Allegations of Support for Torture,” Press Release, October 16, 2014. James Risen, “American Psychological Association Bolstered C.I.A. Torture Program, Report Says,” The New York Times, April 30, 2015. “Statement of APA Board of Directors: Outside Counsel to Conduct Independent Review of Allegations of Support for Torture,” Press Release, November 12, 2014. James Risen, “S. Psychologists Urged to Curb Questioning Terror Suspects,” The New York Times, July 30, 2015. Hoffman et al., “Report to the Special Committee of the Board of Directors of the American Psychological Association: Independent Review Relating to APA Ethics Guidelines,” National Security Interrogations, and Torture, July 2, 2015.